Spruce up your lawn or garden with our beautiful Amish hand-crafted wooden garden windmills. 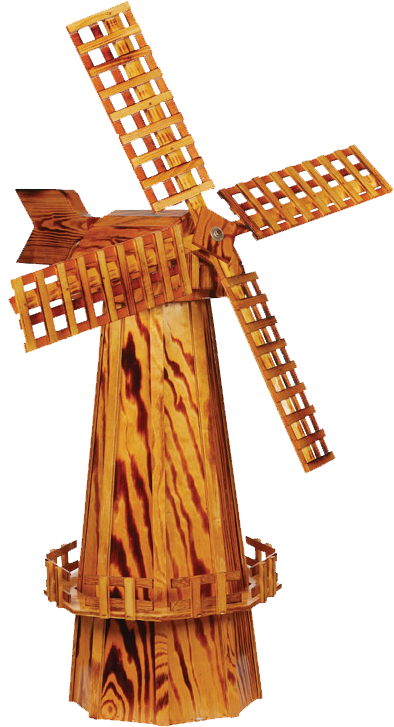 Our wooden garden windmills are constructed of durable exterior plywood with three coats of polyurethane to protect your windmill. These windmills are designed to beautifully enhance your landscape by covering casings, sewer pipes or any other unsightly objects in your lawn. Set your garden windmill in place, kick back, relax and admire this beautiful windmill. Windmill Measurements Height 60" (Measurement taken from bottom to top of Propeller) Height 42" (Measurement taken from bottom to top of Tower) Bottom Inside Diameter 10.25" Max Inside Height 15.25" due to inside bracing. Outside Bottom Diameter 17" Partial Assembly Required.